One explanation for both phenomena is market consolidation. Fewer patients are seeking inpatient care, and those who do are increasingly gravitating to academic medical centers and other large regional hospitals. Thus, about one-quarter of the state’s hospitals are growing and thriving – and claiming the lion’s share of revenue growth – while the other three-quarters are shrinking and struggling. This growing divide between haves and have-nots poses challenges for state policy makers, both in the current debate over Medicaid spending and for the longer term: How do they encourage the efficiencies of regional consolidation without decimating safety-net services at the local level? How do they improve funding for weak providers without needlessly adding to the surpluses of the strong? This analysis, drawing on hospital financial reports from 2012 through 2016, will document financial trends in the state’s hospital industry, discuss the structural forces behind them and explore some of the implications for state policy. Total hospital revenue increased by $14 billion, or 23 percent, three points higher than the U.S. average. Medicaid funding for hospitals increased by $3.2 billion, or 27 percent, 9 points higher than the U.S. average. The number of hospital inpatients declined by 6%, three points higher than average. 44 percent of hospitals lost money in 2016, up from 38 percent in 2012. The average margin of revenues over expenses, at 0.8%, was the 10th lowest in the U.S. Growing hospitals, representing one in four institutions, increased their market share from 39 percent to 46 percent of inpatient care. Growing hospitals collected 71 percent of the growth in total revenue, and 60 percent of the growth in Medicaid revenue. All 11 New York City-owned hospitals were in the red for 2016, accounting for more the half of the losses statewide. The five years from 2012 through 2016 were a period of revenue growth for hospitals nationwide as the economy bounced back from the Great Recession and millions more consumers gained health coverage under the Affordable Care Act. New York’s hospitals saw a bigger influx than most. Their total revenues from all sources surged by $14 billion, or 23 percent (see Table 1 and Figure 1). That compares to an average of 20 percent for hospitals nationwide, and a medical inflation rate for the period of 12 percent. Medicaid payments to New York hospitals grew even faster, increasing by $3.2 billion or 27 percent – roughly corresponding to a one-third enrollment increase driven by the ACA’s Medicaid expansion. At the same time, overall demand for inpatient services, which account for the bulk of hospital income, was declining. Total inpatient discharges for the period dropped 6 percent in New York, compared to 3 percent nationwide. Meanwhile, because New York’s population growth was flat relative to the rest of the country, the state’s per capita hospital revenues jumped from 15th highest to 9th highest among the 50 states. The rising tide of hospital revenue did not lift all boats. A minority of thriving hospitals received the bulk of the new money while the rest either tread water or floundered. The divide between haves and have-nots was driven by a shift in where patients received care. Forty-four hospitals, or one-quarter of the total, saw growth in the number of inpatients treated – and almost all of them had positive bottom lines (see Table 2). The other three-quarters of hospitals experienced declining demand, and just over half were in deficit. Among those experiencing inpatient growth were large, nationally prominent institutions in New York City such as New York-Presbyterian, NYU Langone and Montefiore Medical Center. Also admitting more patients were regional anchors such as St. Peter’s Hospital in Albany, the University Hospital at Syracuse, Strong Memorial in Rochester, Long Island Jewish Medical Center, Westchester Medical Center, Champlain Valley Physicians Hospital in Plattsburgh, Bassett Medical Center in Cooperstown, and Erie County Medical Center in Buffalo. As a group, growing hospitals collected 70 percent of the $14 billion increase in annual revenue since 2012 – even as they handled less than half of the total inpatients. All but seven of them operated in the black for the year. The remaining three-quarters of hospitals, handling more than half of all inpatients, divided 30 percent of the new revenue. Twenty-four of those institutions saw a net decline in income over the five-year-period. More than half operated in the red for 2016. Growing hospitals also claimed 60 percent of the $3.2 billion increase in annual Medicaid funding, while the bottom three-quarters shared 40 percent. Annual gains and losses were distributed unevenly (see Figure 2). The 10 hospitals with the largest surpluses accounted for 65 percent of all gains statewide, and the 10 hospitals with the largest deficits accounted for 58 percent of losses. The largest surplus was $496 million, reported by New York-Presbyterian. 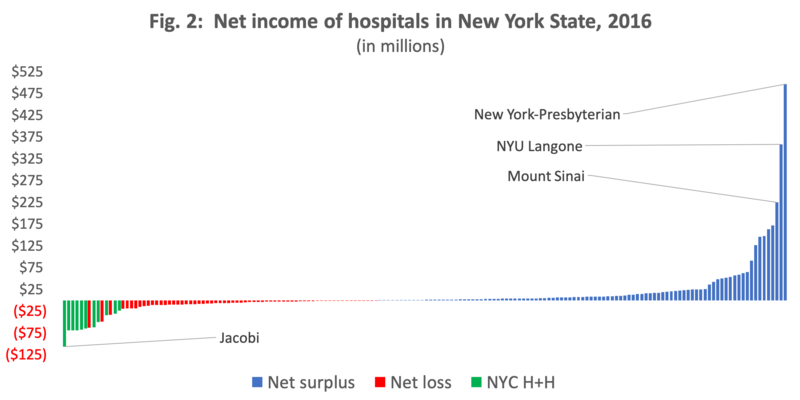 The biggest deficit was $191 million at the New York City-owned Jacobi Medical Center. 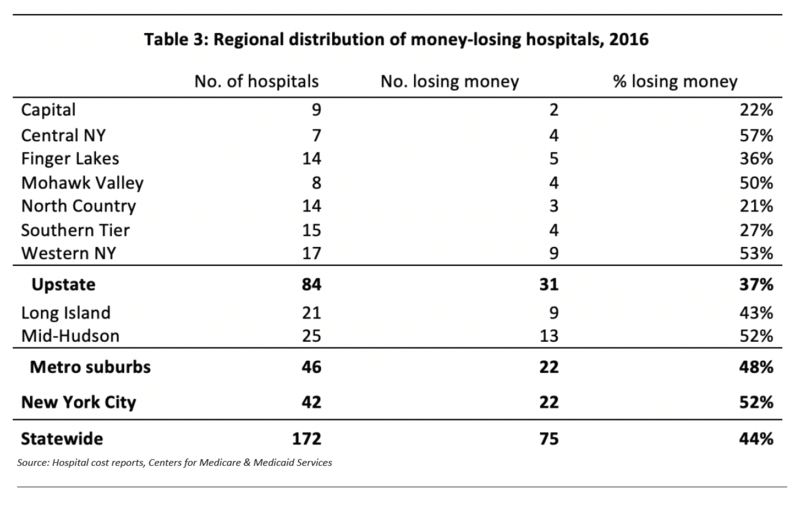 Financial losses were generally more common among hospitals in New York City and its surrounding suburbs than the rest of the state (see Table 3). Among upstate regions, money-losing hospitals were concentrated in Central NewYork, Western New York and the Mohawk Valley. Another concentration of financially struggling facilities was New York City Health + Hospitals, a city-owned system that handles a disproportionate share of low-income and uninsured patients. All 11 of its hospitals lost money in 2016, and their collective deficits of $646 million accounted for more than half of losses statewide. The city’s Bellevue, Coney Island and Harlem hospitals saw rising admissions, but the system as a whole lost patients. Hospital consolidation in New York and the rest of the country has been driven by a confluence of changing medical practices, market forces and government policy. 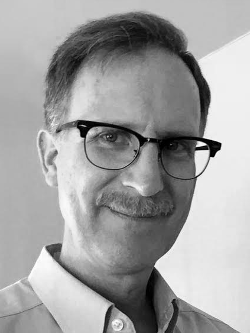 New drugs and therapies have made it possible for more patients to be treated on an outpatient basis, causing a relative decline in inpatient care. Hospitals have been merging and forming networks as a strategy to gain market share and improve their negotiating leverage with insurers. Some consolidation and collaboration among hospitals has been encouraged by policy makers at the state and federal level in hopes of controlling costs and reducing fragmentation in the delivery system. This trend has some potential to be good for public health, because high-volume providers tend to be more efficient and achieve better outcomes. There are also downsides. If hospitals gain dominant market positions in their respective service areas, that can lead to higher prices for insurers, taxpayers and consumers. The trend can also drive smaller hospitals out of business, leaving their communities without ready access to emergency care and other basic services. 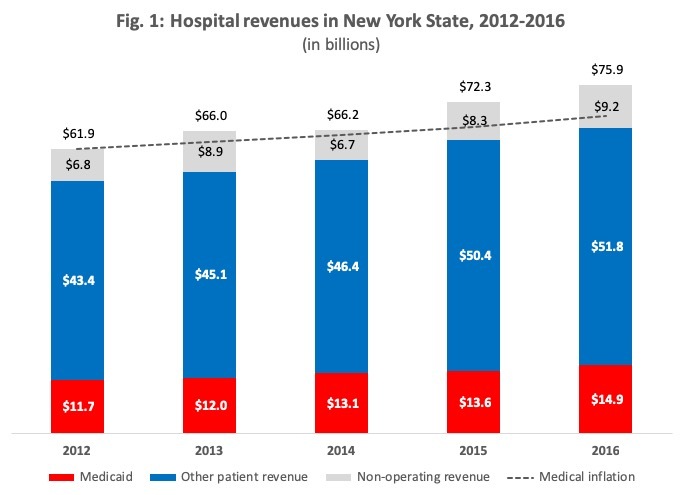 The financial woes of New York’s hospitals cannot be blamed on the state’s general level of Medicaid spending – which was higher than average in 2012 and, as shown above, has grown substantially since then. The cause of widespread deficits is structural evolution in health-care delivery, which state leaders cannot hope to stop – nor should they want to. The state’s goal should be to seek a healthy balance between basic service at the local level and higher-level care at regional hospitals, and to maintain healthy competition among providers – while recognizing that some amount of downsizing in New York’s hospital system is inevitable and necessary. This perspective seems to be missing from the current debate over the Medicaid budget for fiscal year 2020. In February, reacting to an unanticipated dip in tax revenues, Governor Cuomo proposed trimming Medicaid spending for fiscal year 2020. That plan would have reduced total Medicaid spending, including federal matching aid, by about $1.1 billion. It would not have resulted in lower Medicaid from year to year, but rather slowed its growth from 4 percent to 2 percent. Cuomo later backed away from those proposals, seemingly ending the chance that they would be accepted by the Legislature. Hospital associations have been vocal in opposing what Cuomo proposed in February, portraying any reduction in Medicaid funding as an existential threat to the industry as a whole. In reality, Cuomo’s February proposals would have affected different providers in different ways. First, he proposed reversing across-the-board Medicaid fee increases of 2 percent for hospitals and 1.5 percent for nursing homes, which the governor unilaterally ordered in October but had not yet taken effect. This would have reduced state spending by $222 million and overall Medicaid funding by about twice that amount. As seen above, much of the benefit of that increase would have gone to financially strong providers that can easily survive without it. Weaker providers would no longer have received a promised rate hike, but they would not have taken a loss compared to the status quo. Second, he proposed to cap Medicaid-funded charity-care grants to certain large downstate hospitals or hospital systems that showed surpluses of more than 2.98 percent. This would have had no effect on hospitals with weaker bottom lines. Third, he sought a 0.8 percent reduction in overall Medicaid spending, with details to be set by a reconvened Medicaid Redesign Team. If that panel of state officials and industry stakeholders had decided to squeeze savings from providers, it easily could have targeted the haves rather than the have-nots. Even without a budget deficit to fill, all three of these changes might well have been justified as measures to keep New York’s expensive Medicaid program in check. The confused nature of this ongoing debate underlines the need for a new approach to hospital policy, one that recognizes the divergent needs of various industry sub-groups. Going forward, policy makers should retool hospital-related spending programs to assure that they deliver adequate funding to the weak without needlessly boosting the surpluses of the strong. For example, the state’s Indigent Care Pool, which is financed with Medicaid funds, relies on a dysfunctional formula that overcompensates some hospitals and undercompensates others. One result is that hospitals with healthy finances sometimes receive grants in excess of the charity care they provide. Similarly, the state’s health-care capital programs – which totaled $3.78 billion from 2015 through 2019 – have not always focused on need when issuing grants. Among the awards announced in 2016 were $25 million to finance medical office buildings for a thriving multi-specialty practice in Orange County, and $7.9 million to New York-Presbyterian Hospital, which is one of the state’s largest and financially strongest providers. The deficits plaguing almost half of New York’s hospitals cannot be wiped away by more state spending on Medicaid – which has long been high compared to other states, and has grown substantially since 2012. Instead of simply pumping more money into a shrinking hospital system, the state should accept that its role is to manage the consolidation, not stop it, and do a better job of allocating resources among haves and have-nots. New York hospital revenues surged by $14B from 2012 to 2016. So why are so many of them losing money? NY's hospitals are increasingly divided into have and have-nots. @NYHammond explores why.